Baseball Federation of Asia (BFA) announced schedule and venues for the 10th BFA Baseball Championship 2018 in Taipei. 8 teams will compete for the Championship from August 13 to 19, which will serve as a qualifier to 2019 WBSC U-12 World Cup. 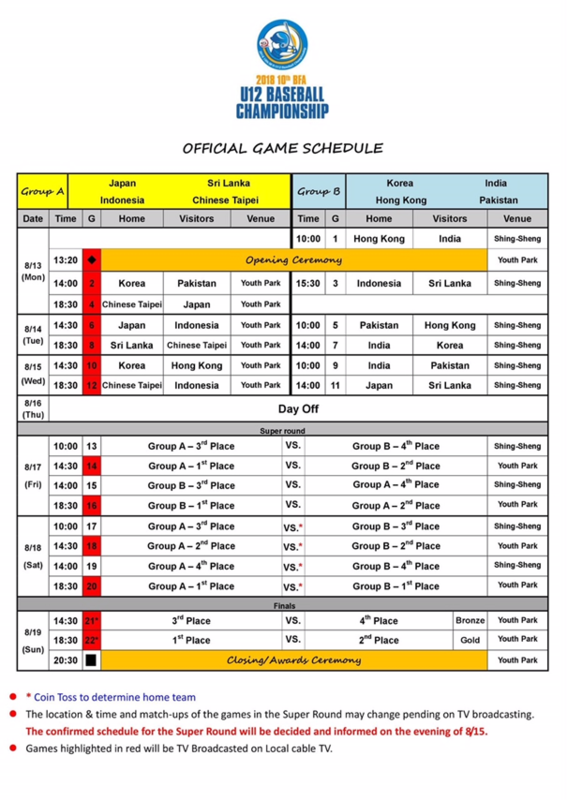 The top three teams out of Chinese Taipei, Hong Kong, India, Indonesia, Japan, Korea, Pakistan and Sri Lanka shall be eligible to participate in the World Cup. At the preceding 9th BFA U-12 Asian Championship, the 9 teams from Japan, Korea, Chinese Taipei, China, Pakistan, Hong Kong, Indonesia and Philippines played in Guangdong, Zhongsha, China from December 9-13, 2016.